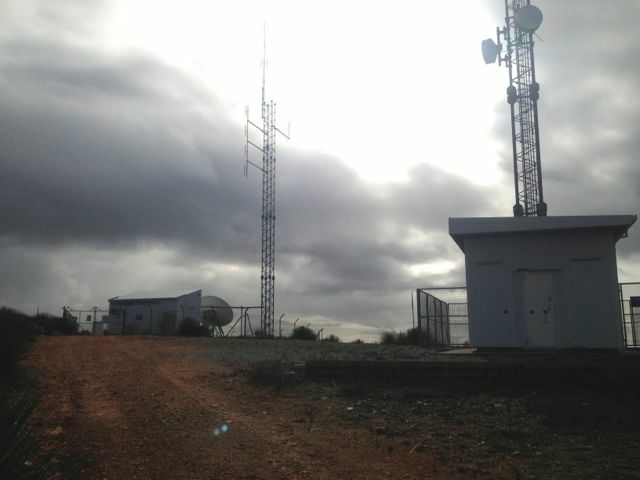 On Saturday 16th June, 2013, I activated North Block, VK5/ SW-024, which is situated about 55 kms north west of Port Lincoln. The summit is situated about halfway between the little towns of Coulta and Edilillie. North Block is 365 metres above sea level and is worth 1 point. It is about 700 kms from Adelaide. I had based myself in Port Lincoln for 2 nights, so it was another early start from Lincoln. I got up at about 6.00 a.m. and drove out along the Flinders Highway, through the town of Wangary, and then further north to the little town of Coulta. A few kms north of Coulta, I turned right onto Gap Road. The road is aptly named because it takes you right between North Block & South Block, which stand very close together. The summit is located on private property owned by Darrell & Isobel PUCKRIDGE, who are a very friendly couple. I called in there first to say hello and collect the key which is required to undo one of the padlocks on the gate to gain access to the summit. There is an Air Australia navigation facility and a radio tower on the top of the summit, so there are a few locks on the gate which belong to each of the stakeholders. 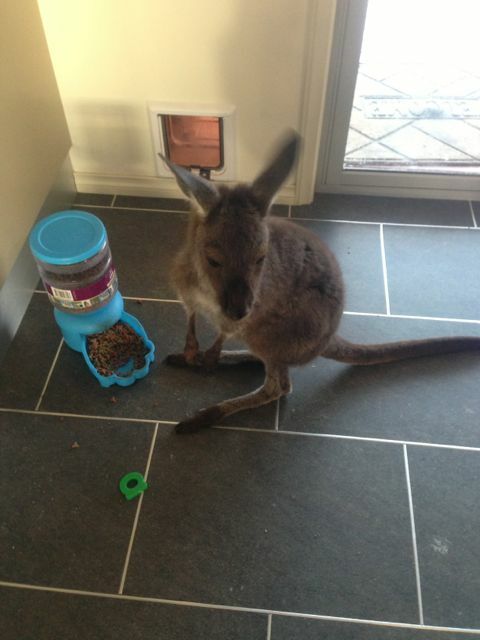 Whilst there I was introduced to Darrell & Isobel’s young kangaroo, which clearly thinks it is a dog. The gate to gain access to the summit is located a few hundred metres west of Darrell & Isobel’s property, back down Gap Road. 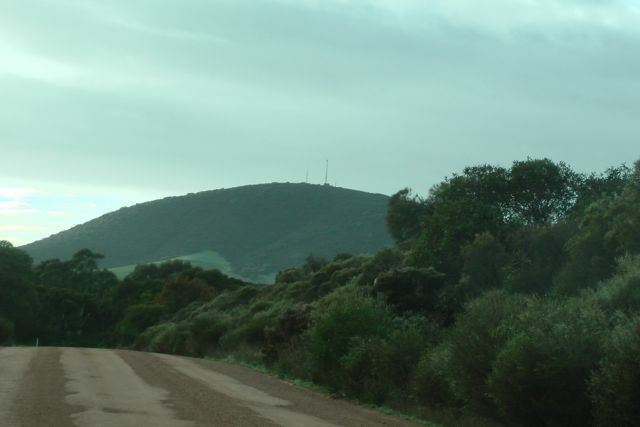 There is a dirt road, which is in good condition, which leads all the way up to the summit. After travelling through the paddock, there is a sharply rising section of the track. I parked my car at the top of this and then walked the rest of the way to the summit, which was probably about a 1 km walk. At the top there is an Air Australia air navigation system and a very large radio communications tower. The weather looked really lousy all the way around me, particularly to the east of me. After setting up my gear and turning the radio on, I was saddened to hear a noise floor of about signal strength 7. But I had already set up and the weather was threatening, so I decided to hang in there and work as many as I could for as long as I could, before having to dash back to the car. 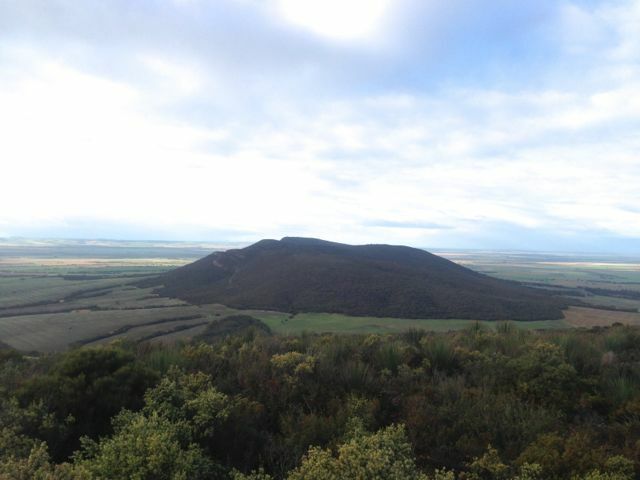 There are some spectacular views from the top of the summit in all directions. It was just a pity about the gloomy weather, but I guess that’s what you expect for June. South Block is the closest imposing feature, rising 391 metres ASL, and is in very close close proximity to North Block, just to the south. Out to the west, you can clearly see Mount Greenly & Mount Dutton, both of which I had climbed and activated the day previous. 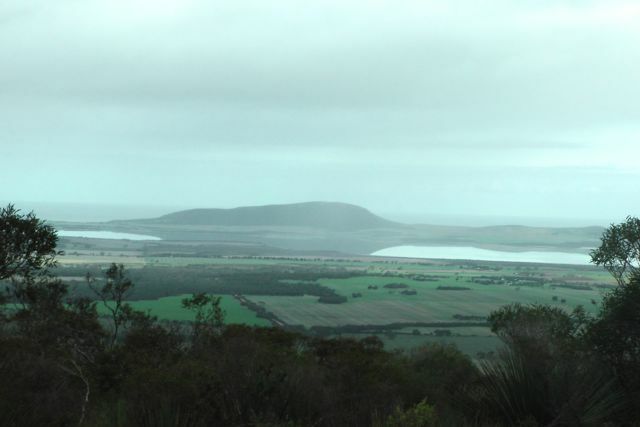 To the south west, was the imposing Marble Range, which is on my list of summits to do on my next Eyre Peninsula trip. Many of the winter flowers were out on the top of the summit, including the beautiful correas and the flame heath. My first QSO of the morning was with Peter VK3PF, who had his normal strong signal. This was followed by a few of the regular ‘Chasers’ and some not so regulars. It was great to hear a few new calls. 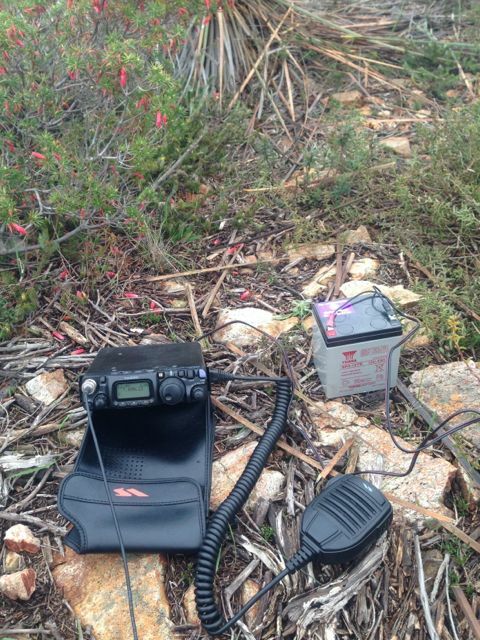 I spoke with Ian VK5CZ, who was portable on Brown Hill Range, VK5/ SE-004. I managed two s2s contacts with Ian, before & after the UTC rollover. And to my listening pleasure, the noise floor dramatically dropped on 40m after about 10 minutes. Andrew VK1NAM had put out a challenge during the week for ‘Chasers’ to try operating over the weekend with QRP. I had a few good QRP to QRP contacts with Ernie VK3DET who was using just 5 watts. Each time I spoke with Ernie he was a very comfortable copy (5/7 both ways). I also spoke with Andrew VK2UH, who was initially using 5 watts and was a good 5/7 signal. He then lowered his power output down to 1 watt and I was able to clearly hear him, signal report 5/5 with some QSB. I also spoke with Jim VK5JW who was also using just 5 watts. I ended up with a total of 45 QSO’s All on 40m SSB. I managed 22 QSO’s before the UTC rollover, and a further 23 QSO’s following the UTC rollover. The following stations were worked before the UTC rollover:- Peter VK3PF; Warren VK3BYD/p; Steve VK3MEG; John VK5EMI; Darrel VK5JDS; Col VK5HCF; Nev VK5WG; Fred VK3JM; Andy VK5AKH; Peter VK3ZPF; David VK5UG; Ian VK5CZ/p (SOTA); Dave VK3VCE; Ed VK2JI; David VK5KC; Rhett VK3GHZ; Ernie VK3DET; VK3UBY; James VK1DR, Nick VK3ANL; Rik VK3KAN/m, & Mark VK7FMPR. The following stations were worked after the UTC rollover:- Mark VK7FMPR; David VK5UG; Fred VK3JM; Nev VK5WG; Rhett VK3GHZ; Peter VK3PF; Dale VK5DC; Andrew VK2UH; Col VK5HCF; Rik VK3KAN; Tony VK3CAT/m; Nik VK3ANL; Brian VK5FMID; Ian VK5CZ/p (SOTA); Ernie VK3DET; Ron VK3AFW/m, Allen VK3HRA; Glenn VK3YY; Andy VK5LA; Jim VK5JW; Ted VK5KBM; Trevor VK5ZTJ/m; & Bob VK5ZRJ. I would have stayed longer except for the weather. At the last minute the showers started to come in and I was forced to go QRT rather quickly, disassemble the antenna and do a mad dash back to the car. Sorry to anyone who may have been calling. More information on PeakClimbs at…..
Below is a video of my activation, which I have placed on You Tube. Good to see the chaser went QRP for you too. Oh and great to see the Flag flying proud. 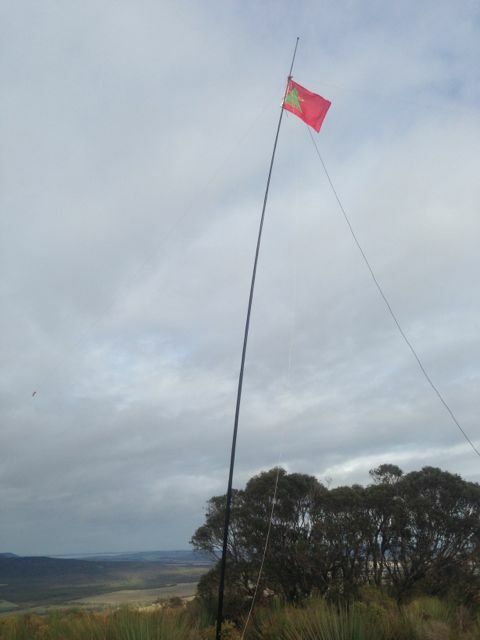 I’ve just bought the SOTA flag, so this SOTA trip was the first time I got to fly the flag. And fly it did, most of the time, because of being in the middle of winter. Its a bit of a novelty the flag, but a welcome addition to my squid pole. I am sure if more of the chasers called us QRP, they would get a pleasant surprise. The lack of noise on the top of most of these summits is truly amazing. I wish it was like that here at home.